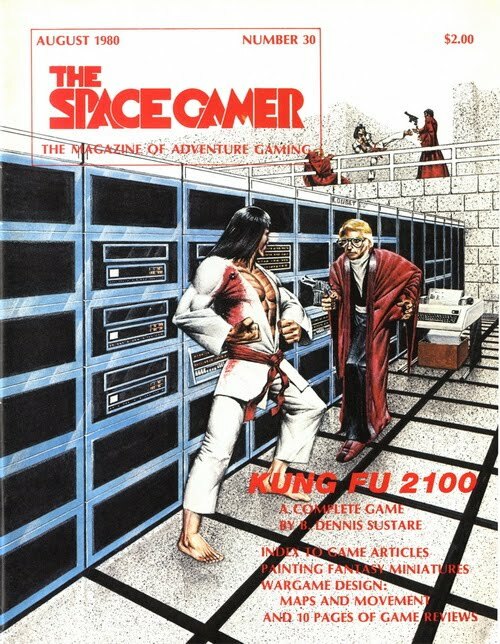 For its first 26 issues, the storied Space Gamer magazine was a house organ owned and published by Metagaming Concepts. Metagaming used the magazine to promote their upcoming products, and included some -- but not much -- coverage of products by other companies. This all changed after the magazine changed publishers. Starting with issue 27, The Space Gamer was published by the upstart Steve Jackson Games and continued to be published by them for another five years. The Steve Jackson Games run of The Space Gamer is one of the best runs of any gaming magazine in the history of the hobby. James Maliszewski has recently waxed nostalgic about the title and by I talked about the magazine here when SJG started offering their issues as pdfs for sale at their e23 webstore (they are a steal at $2.99 each). In addition to publishing news and articles reviewing/supporting existing games on the market, the Steve Jackson era of the magazine included a number of classic minigames. Some -- like Allen Varney's Globbo where humorous in nature -- and others -- like Battlesuit -- were games that were inspired by other Steve Jackson products. Most of these games were quite good, but one struck a particular chord with me when I first encountered it as a wee tyke. 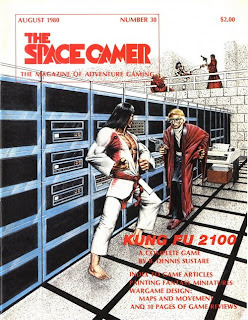 That game was Dennis Sustare's Kung Fu 2100. The game had everything -- martial artists, secret laboratories run by evil scientists, and transhuman clones. Dennis Sustare is not a well known game designer today, but he designed some very good micro-games in the 80s. 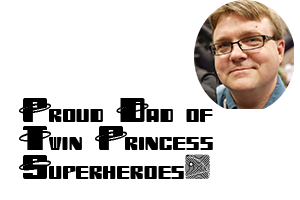 His Star Smuggler game is an entertaining solo game where the player takes on the role of a Han Solo-esque freetrader, and his Intruder is a playful combination of A.E. Van Vogt's Black Destroyer and Ridley Scott's Alien that plays like Star Trek meets John Carpenter's: The Thing. This is likely because both Alien and Star Trek were inspired by the adventures of Van Vogt's Space Beagle, and Sustare's game captures the anxiety of a crew of scientists dealing with an otherworldly threat. Issue 27 asked readers to describe what was going on in the above image. Readers could present a game idea or write a short piece of fiction. 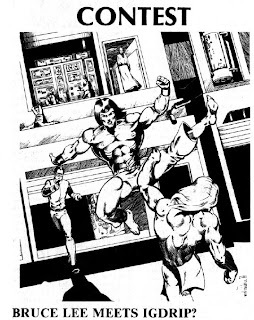 Sustare did both and the his winning submission became the complete game insert for issue 30. Kung Fu 2100 was eventually published in three different formats. The first was as the insert game in issue 30 of The Space Gamer for which you will need issue 31 to get the errata to the game -- there are a couple of errors. The second version was a minigame enclosed in a ziplock bag, and the final version was identical to the second except that it was now packaged in SJG's signature minigame box. In the end, the game got nice packaging and provided hours of fun at an inexpensive price. For years the CloneMasters have ruled the world. Their only foes are the Terminators -- trained from birth in the martial arts. Now you are a Terminator. Your mission: smash your way into the CloneMaster's fortress...chop through his defenses...and destroy him forever. The game features an interesting combat system where kung fu maneuvers are selected in secret and later revealed as combat occurs simultaneously. The game uses an interesting alternating movement system in order to maintain game balance. The Terminators are tougher than their opponents, but they are badly outnumbered and only the right combination of stealth and skill selection will help them defeat the dreaded CloneMaster. The components of the game have never been nothing special, you have to hand cut out the counters, but I have always wanted to make a project of making a "home play edition" of the game. I'd replace the small counters used to represent maneuvers and replace them with small eurogame sized cards. The Terminators, Jellies, and CloneMaster would be represented by stand up paper minis -- likely from the Cardboard Heroes line by SJG. I'd also make a more modern looking map. I'll get around to it some day, but that day will have to wait. As it is now, you can get a copy of the game for $2.99 by buying issue 30 of The Space Gamer, printing out the proper pages, and getting down to having a good time. You might want to buy that copy of issue 31 for the errata, but that issue is worth the purchase for the reviews alone. Before I forget, one of the most interesting things about the game is that the Terminators are a part of the Cult of Thanatos. The reason they despise the CloneMasters so much isn't entirely due to the tyranny of CloneMaster rule. The Terminators are far more upset that the CloneMasters seek immortality. The Terminators are part of a cult that glorifies death, and seeks to bring destruction to those who are avoiding the inevitability of death. I had entirely forgotten about Kung Fu 2100. It is an entirely awesome and fun game. Thanks for reminding me of good memories and a great game. The Space Gamer nostalgia wave continues! I was already contributing to the magazine when that original illo appeared in SG #27. That baffling caption, "Bruce Lee Meets IGDRIP," refers to my short story that appeared immediately before the illo -- a humor piece about computer software that designed wargames: the Instantaneous Game Design and Rules Intensification Program. Those magazine games were fun, both the occasional entries in Space Gamer and the historical wargames in every issue of SPI's Strategy & Tactics. I don't know of any fan site today that offers anything similar, though I'm sure there must be some. But as I commented on James Maliszewski's post, I still think the nostalgia for Space Gamer fails to acknowledge how completely the web has trumped the old magazines in quantity and quality of content.